Why do I receive "License Manager Error -8"? License checkout failed. Encryption code in license file is inconsistent. 3. The system time and date are not set properly. Check to make sure that the date and time are set correctly on the machine before proceeding below. This issue may also occur if you are using MATLAB R2007b or below with a standalone license file generated for R2008a or higher.In this case, generating a license file for the correct release of MATLAB will resolve this issue. 1) Make sure that the Host ID specified in the license file matches the Host ID on the "SERVER" line of the license file. Also if the Host ID is not proceeded by "ID=", it must match the Host ID of the license server. For more information on obtaining your Host ID, see the related solution listed below. # MATLAB license passcode file. NOTE: Changing the Host ID listed in the commented section of the license file will not resolve the error. If your Host ID is incorrect, you will need to obtain a new license file generated for the correct Host ID. 2) This error may be the result of having extra carriage returns in your license file. In order to avoid this, ensure that the following strings all begin on a left justified line: #, SERVER, DAEMON, or INCREMENT. Sometimes an INCREMENT line can get wrapped on the end of the preceding INCREMENT line causing it to be omitted. i am getting the same error message,but i can not find(i searched) the file named license.dat in the directory i installed matlab.what to do ? i have same problem, my license file does not configure like above. I can't find the license.dat file in the directory where i installed matlab. Any solution for me? Ah!! At las could find a little solution for this for the licence manager. If you are still encountering this problem after following the instructions in this article, please contact MathWorks support. ali serin: please contact Mathworks for free installation support. Note: Monday July 4th 2016 is a holiday in the USA, but if you have a more local support site then you can contact them. My .lic files don't have a SERVER line. 1,My .lic files don't have a SERVER line also. 3,what is "license server machine"? Where and How can I find it?my matlab activation without internet. I meet the same problem now and could you tell me how you figure it out? can ypu provide the same answer for linux ubuntu? who can fix this problem? If you are still receiving this error and have tried all the steps listed above then please contact our support team so we can assist with resolving the error. I have got a same problem in installing matlab 2016a;it's simple!All you need to do is to download this file;Then open it,it has four subfiles;Copy them and find out your installation content where has the same name:'bin'.Replace it.Enjoy!!! MAN.... saved a life for me. thanks. Hi , where is this subfiles ? hello,where can i download subfiles? thank you a lot! where you download this file ? thx!Your answer helps me solving this problem. which bin file should be copied. please guide as I have around 19 files in bin folder? If the instructions above did not help, then call the Mathworks directly for free and fast telephone help. It takes a lot of resources to produce a video that would cover all of the possibilities on all of the operating systems. You would be better off contacting Mathworks Support for free installation assistance. Was Mathworks Support unable to assist you with your installation problem? I estimate that it would take me about a month or two months of full time effort to create a suitable video, as I would have to research all of the possibilities, load all of the different operating systems, figure out how all of those operating systems worked, research all the various ways things could go wrong. Make that three months full time work, perhaps four. Plus the time to learn video editing, and the cost of buying the various operating systems to experiment with. I am sure I would have learned a lot by the end, but keep in mind that during that time I would not be answering Questions here because I would be busy working on the video to answer one Question. A Question that Mathworks Support might already know the answer to for any particular operating system and release. are all version of MATLAB so complicated to install? I cannot even start the MATLAB R2016a. If there is a version which is simple to install and start. what version is it? In the case of individual licenses, the last few versions of MATLAB have been easy to install: download the installer, start it running, indicate your agreement with the licenses in the appropriate place, provide your Mathworks login credentials, select which of the products you want to install, indicate where you want to install them, set it executing. Eventually, indicate which user it is authorized for, and request activation. If you are using a license server for a commercial or academic license, then Yes, matters get more complicated. Unfortunately, license servers do tend to be complicated. The other major vendors of similar software all use the same licensing technology so the situation is the same for them. Most of the time this error happens when the folders listed in the readme files are not properly copied to the %installdir% to overwriting the originally installed files. So make sure you replace them prperly. Disappointed with the installation procedure. Facing this same issue. Is there an easy way out? This is not user friendly at all. This error condition only applies when a license server is being used. Unfortunately it turns out that license servers are surprisingly complex. Mathworks uses Flexera's flexlm license server, which is the same license server used by many many software packages, including all of the major competitors to Mathworks that I could think of to check into. It has since come to my attention that another case in which this problem shows up is in connection to some cracked versions of MATLAB. We delete all information about how to crack MATLAB. Did you reinstall Matlab after changing the laptop name? That would happen if you installed the network license daemon (flexlm), but that the MAC address you requested the license file be generated for is not recognized as one of the MAC addresses of the license server. This could happen due to a mistake in which system the license was requested for. It could also happen in some Linux environments due to changes in the ethernet device naming conventions. It can also happen in some OS-X or MacOS environments that have dual thunderbolt displays installed. It can also happen in some Linux systems that have no hardwared ethernet ports (only WiFi) and the system has been configured to randomize the WiFi MAC address on every boot. 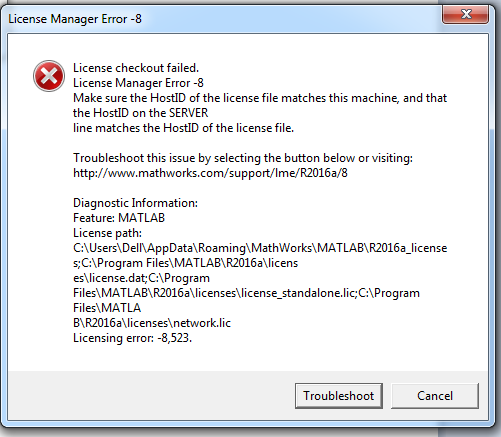 i got license-error 8523 after i install matlab why is that? The error would have been -8,523 rather than 8523 . The causes are as explained above. Hi, please help me to solve following problem! Finally issue is solved by taking the reference of previous answer! i got same problem , can you fix this ? Just make a file named as licenses in R2016b folder and then add your license files in that folader. Then copy your bin,licenses and toolbox folder from R2016b folder and paste it in programfiles where your matlab is located. please help me to solve this problem (matlab 2016 (64 bit)? If the steps described above do not work for you then you need to contact Mathworks Technical Support. If the steps in Mathworks' response did not solve the problem for you, then you need to contact Mathworks for free installation support.